Now closed; was a Fuller's pub on Putney High Street. It closed towards the end of July 2013. 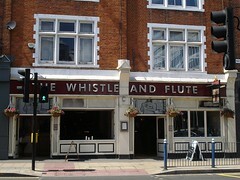 As of August 2013 the premises are occupied by a bar called The Swift photo. Fuller's pub on Putney High Street. It's neither a scruffy old boozer nor a tarted-up gastropub, but somewhere in between. A couple of nice leather sofas are placed by the windows right at the front, and are well-lit during the daytime, but there's much less natural light further back. There's also a little snug-type area up a few steps at the back photo. Although they have five handpumps, on both our visits there have only been two real ales on, one of them being London Pride. In October 2008, the other ale was Fuller's Red Fox (£1.60/half), and in June 2013 it was Gale's Seafarers (also brewed by Fuller's). On the latter visit they also had Honey Dew, San Miguel, and Veltins on tap. Kake first visited on a Friday afternoon in October 2008, arriving just after 2pm. Although I had no trouble finding a table, there were a fair few people in; a mix of women and men. Piped music was playing, though fairly quietly. On another visit in the company of bob, on a Monday lunchtime in June 2013, there were a handful of other customers. Music was playing again, not too loud. As of June 2013, food is served 11am-10pm Mon-Sat and noon-9pm Sun. See photo of menu as of the same month. As of June 2013 they have free wifi via O2 (you need a mobile phone to register for this). Accessibility: No steps to get in (just a very shallow ridge at the entrance). Step-free access to the bar and most of the seating area. Step-free access through to the toilets too, including a RADAR-locked accessible one — but beware if going through the little passage behind the bar as the floor is uneven. On an October 2008 visit, there was a mobility scooter parked just inside the door, so it seems disabled-friendly in general. Last visited by Kake and bob, June 2013. Last edited 2016-11-27 21:56:38 (version 16; diff). List all versions. Page last edited 2016-11-27 21:56:38 (version 16).